The red pin (left) is Long Pond Bay. Zoom in on the Anguilla map for more detail. Long Pond Bay is an area of dramatic contrasts. On the one hand, Long Pond Bay gets some of the wildest wave action on all of Anguilla. Enormous waves constantly crash violenty down on the beach's rocky shoreline! But not far from the beach, there is peace and stillness... Long Pond Bay gets its name from "Long Pond"... The saltwater pond right behind the ferocious beach. Many local homes overlook the quiet pond and the fierce beach, but not many of these homes are available to rent. 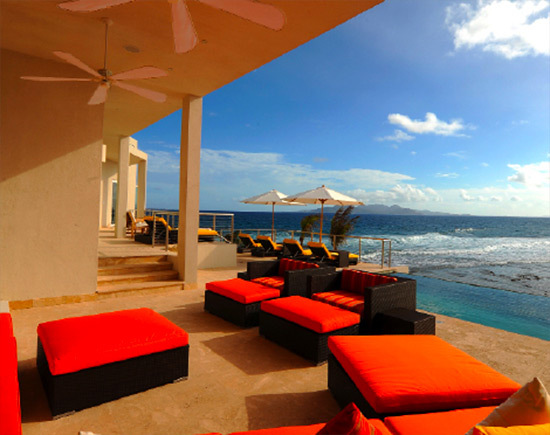 Although Anguilla villa rentals may not be an option on Long Pond Bay, there are villas in the surrounding area. Location: On the sea rocks past Long Pond Bay, on Dropsey Bay. Description: This three bedroom offers beautiful views of St. Martin, the Caribbean sea and St. Barths. It is a two minute walk from the sandy and virtually private shores of Dropsey bay (home to some of the best snorkeling in Anguilla), AKA "Lover's Cove." Lover's Cove has been the site of many proposals, even weddings, in Anguilla. It is truly a romantic, secluded spot. If the sea is not to your liking, Tequila Sunrise also has a refreshing infinity edge pool. The villa's decor is modern and tastefully colorful, and service is just right. Daily breakfast, turn-down service and laundry service is included in the rate. It is loved by many for its personal and friendly feel. The owners are so caring and ensure a top-notch vacations. Click for our stay at Tequila Sunrise Villa. 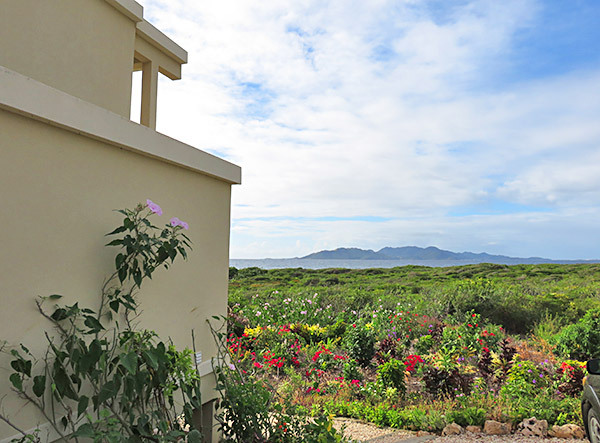 Click for the owners' story of building Tequila Sunrise Villa. Description: Rum Punch's luxury is defined by its construction and decor, from its Italian design, to the expansive views of St. Martin, and endless views along Anguilla's southern shoreline. Rum Punch is a "feeling." The main floor is made up of a large living space with infinity edge pool. There is an in-home cinema, dining, and large outdoor kitchen area. Outdoor living is emphasized. There are two smaller bedrooms, and one large master bedroom with private balcony over the Caribbean sea. There is an apartment upstairs, affording extra privacy and more panoramic views. Click for more on Rum Punch villa. Location: On the sea rocks outside of Long Pond Bay. Description: This villa villa lays out to take maximum advantage of the views out to sea. In an up and coming community area (near Ocean Terrace Condos) and our own home, the location is peaceful with plenty of breeze and beautiful sunsets. The lack of beach is made up by views out to St. Martin and St. Barths, and its large pool. White Cedars offers plenty of spacious, bright and clean rooms, with high ceilings and nice white wood accents. The service is also exceptional. Location: Overlooking the Caribbean Sea, just outside of Long Pond Bay. Description: A charming villa, Moondance Villa offers all of the comforts of home. The first floor features a spacious kitchen, living dining area, home theater and spacious outdoor deck with pool, while the second floor boasts two master bathrooms with balconies and private en-suite bathrooms. 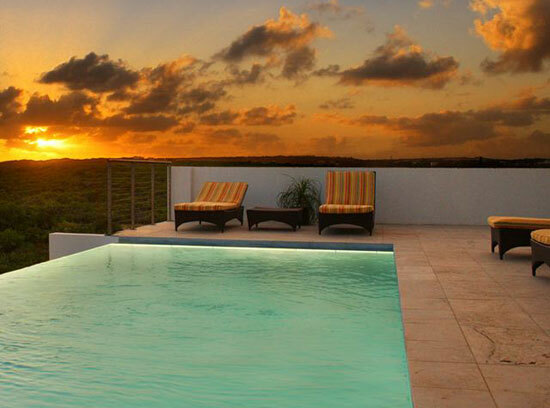 With a fresh and contemporary Caribbean beach house feel, excellent amenities and at a reasonable price, Moondance Villa is an top Anguilla villa rental.